ProDen PlaqueOff is a completely natural food supplement that is suitable for dogs and cats, as well as other animals including ferrets. It contains a special kind of seagrass that is good for the teeth and jaws. It has been tested (on people at first) in several studies, and is now also available for animals. 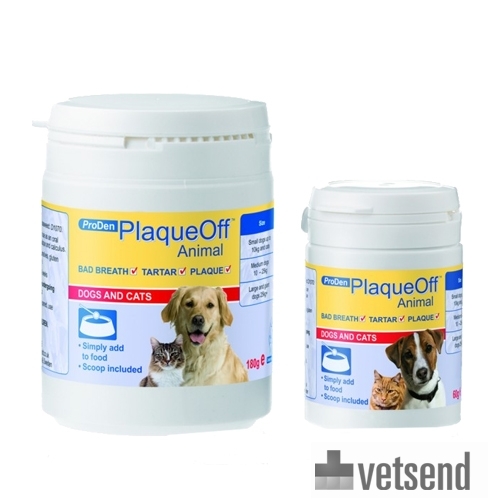 ProDen PlaqueOff is a powder and is therefore easy to scatter over your pet's daily food. It is rich in natural iodine and contains important vitamins and minerals. It contains no colourings, preservatives, gluten or sugar. N.B. For small animals such as ferrets, a lower dose of half a teaspoon can be given every other day. A unique composition of sea salt algae, obtained from a particular type of seagrass, includes polysaccharides (52%), minerals (including iodine) and trace elements (22%), protein (6%), Omega-3 fatty acids (2%) and a number of vitamins. Have you used ProDen PlaqueOff before? Let us know what you think about this product.